Home > Coffee/Tea > Kurukahveci Turkish Coffee. 250gm. 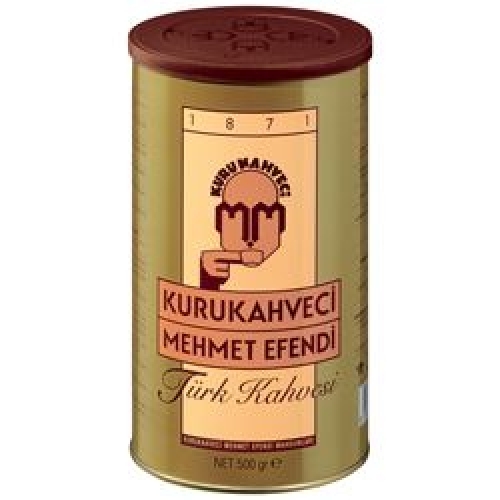 Imported from the premier coffee company of Turkey, this excellent product should be prepared in the traditional method, cooked in a "cezve", or Turkish coffeepot. Taste coffee in the flavorful way it was first made when it was discovered in the Middle Ages. How to make Turkish Coffee? Use one full coffee spoon of Turkish coffee per person Use one coffee cup full of water per person Use sugar as per your taste (half a dessert-spoon per cup recommended) You start by adding and mixing the coffee, sugar and cold water into a coffee pot. Keep the stove at low until you see foam appear on top of the pot. Pour the foamy part of the coffee into the cup (special Turkish coffee cups recommended - called "fincan"). Then return the pot to the stove and bring the remaining coffee to a boil. Pour the boiling coffee over the cup all the way to the top. Your Turkish coffee is now ready to serve.